The Matthewis Persen House gives educators the opportunity to merge a lesson with an in-person experience. The Kingston City School District (KCSD) 4th grade students in 2017 did just that. 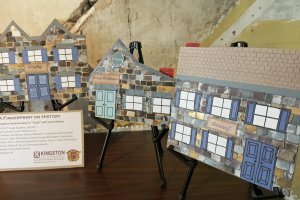 After a lesson on the Persen House and the historic “Four Corners” provided by Instructional Coach Michael Circe, the KCSD 4th grade gifted the County Clerk’s Office with their wonderful exhibit “A Fingerprint on History.” Students from all 7 elementary schools created “stone” houses made from their fingerprints. The County Clerk’s Office now proudly displays this exhibit each year at the Persen House.